It is a short time before the service is to begin and Stephen is already pacing nervously about the church. 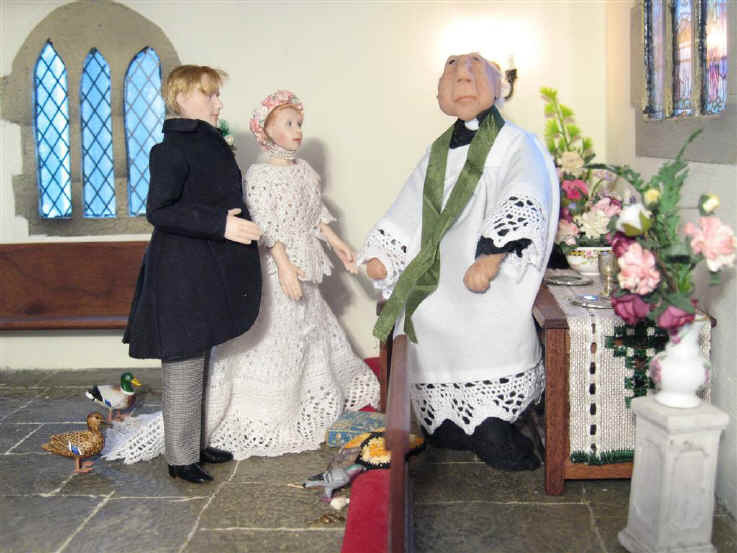 Ambrose is admiring the two beautiful nuptial kneelers that have been embroidered for St. Hilary's Church by the embroidery guild! He is showing them off to Alice who he hopes will turn her mind to the idea of marrying HIM in the future! Nunc Dimittis and a mouse friend of his also admire the newly embroidered kneelers which will be used for the first time at this special wedding of Esther and Stephen. 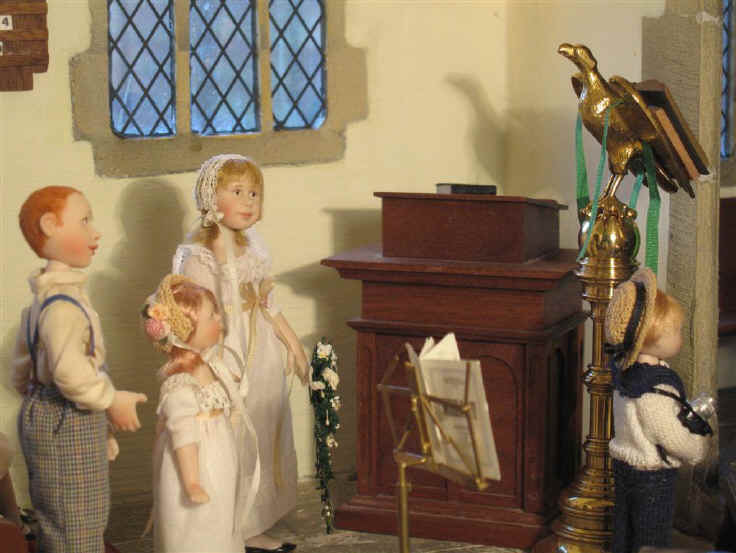 The vicar has gathered the bridesmaids, Alice and Megan, at the back of the church as they await the arrival of the bride, Miss Esther Ford. Priscilla Jane is a VERY observant girl and had just noticed a cobweb on the floor not far from the church door. 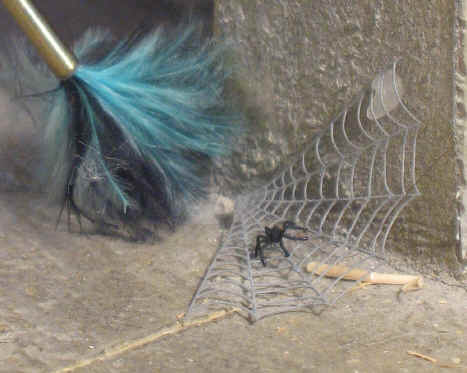 She went and fetched a feather duster in preparation for cleaning the web away. However what a surprise she had when she went back to dust the cobweb away. There in the middle of the web, was Percy, the owner of the web! "Oh dear" Priscilla Jane thought, as she was suddenly not so happy about cleaning the cobweb away. Tom was REALLY proud and delighted to be asked to be the official wedding photographer at this special church wedding! 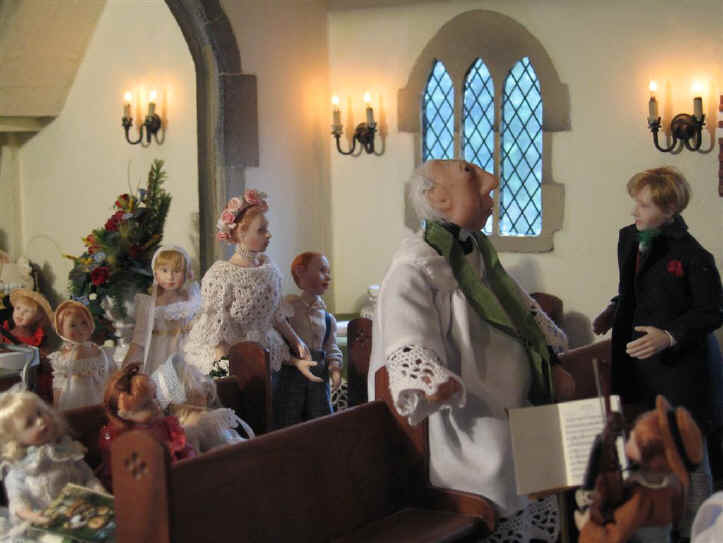 As you can see Priscilla Jane thought long and hard about it and decided, after asking the vicar what to do, to let Percy stay! Percy was quite relieved to hear about this as you can imagine! 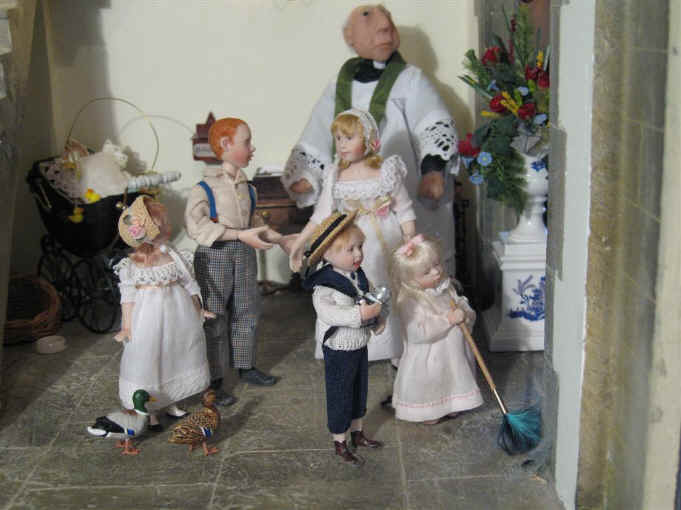 The vicar later explained to the children that spiders in England were very helpful because they ate flies and that is good because flies are pests that carry disease. He then went on to explain that spiders in EVERY country needed to be treated with great respect and not disturbed unless it was considered absolutely necessary. Miss Esther has finally arrived at the church! Tom is there as you can see ready to take the very first picture of the bride on her arrival at the church! Poor Mr Stephen!! He looks as if he has waited ages for his bride, Miss Esther, to arrive. Ben and Phoebe have been practising together really hard for this special day as you can see! 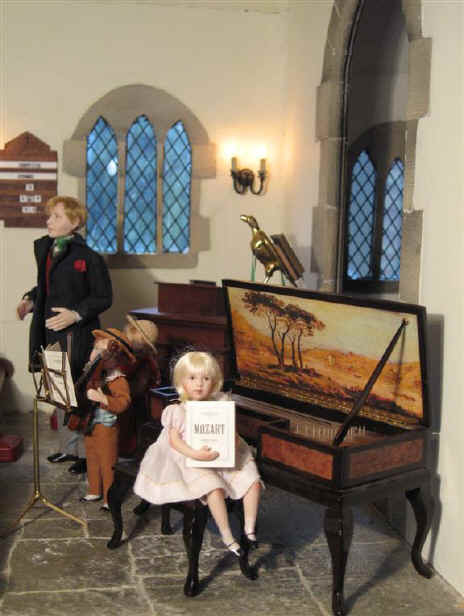 Ben has been learning the violin whilst Phoebe has been learning how to play this beautiful spinet. They are going to play some music whilst the bride makes herself ready to process down the aisle. 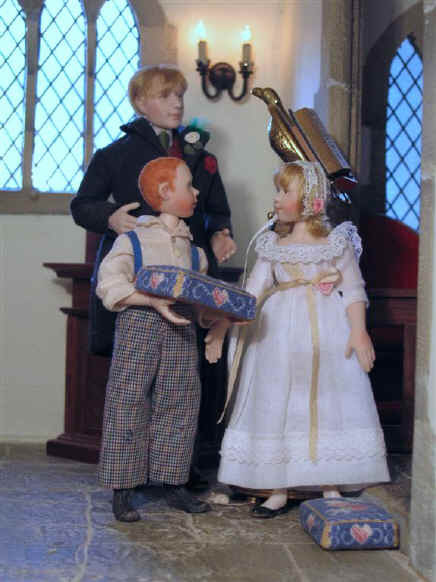 Poor Miss Esther's father is no longer alive so she was thrilled when young Ambrose offered to walk her down the aisle instead. Ambrose was worried at first because he couldn't afford to buy or hire a lovely suit like the groom was wearing. However Miss Esther assured him he was "just fine" as he was! After all he was ALWAYS clean and tidy when he came to church. Of that he took great pride! Look at our feathered bridesmaid here! It is no less than our Esme, a lady Mallard duck who lives in the nearby pond! 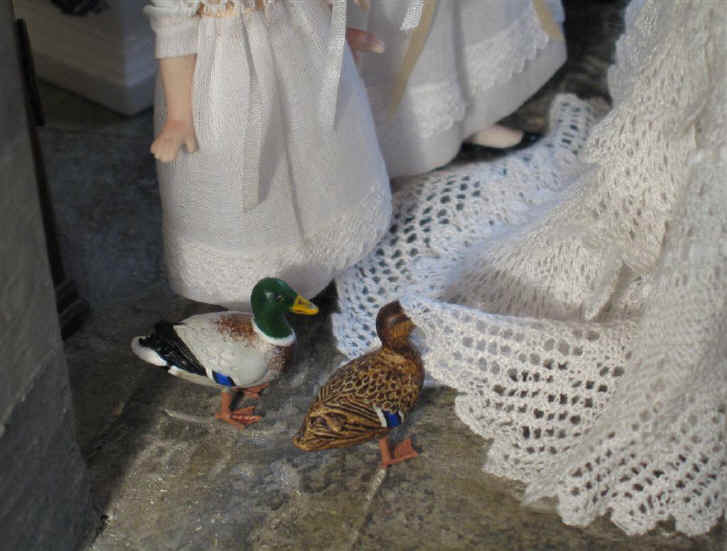 She was VERY worried that neither Alice nor Megan, the human bridesmaids, had remembered to help Miss Esther down the aisle by holding her wedding train for her. We think that Esme has made up quite perfectly don't we by holding Miss Esther's train all by herself with her beak? 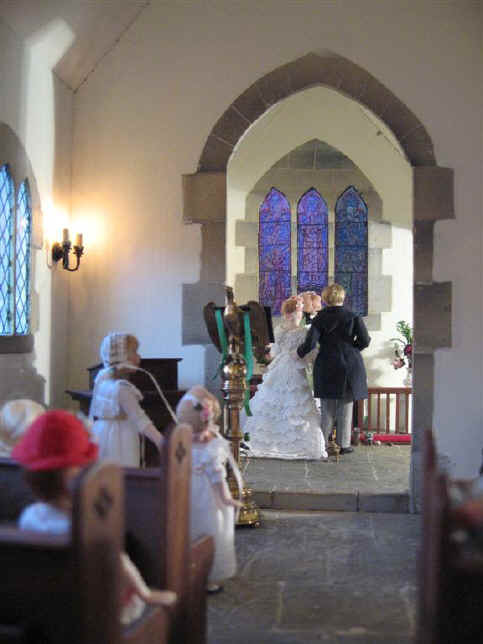 The vicar takes the couple up to the altar rail after he has married them and gives them God's blessing on their marriage. 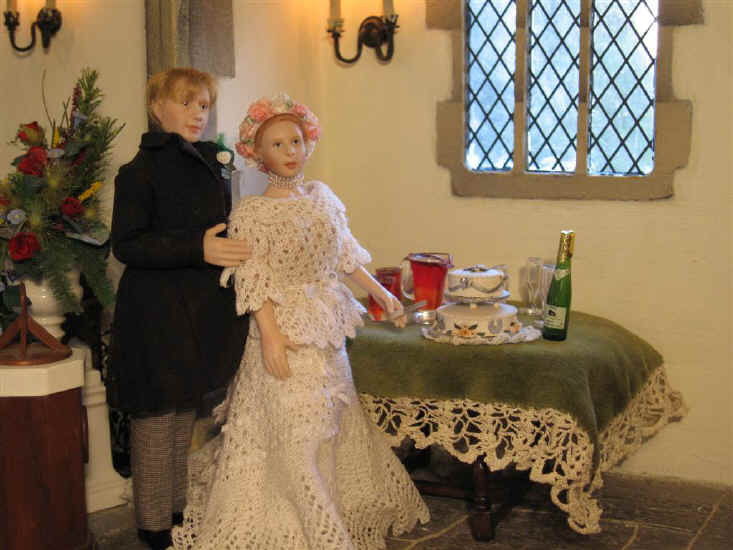 The flowers have been especially arranged for the wedding by the church flower ladies. Haven't they done a wonderful job?! 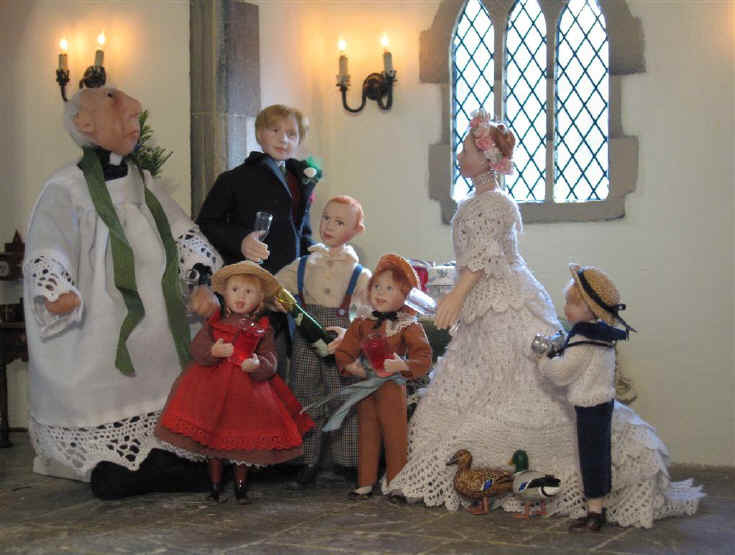 Alice, Megan, Ambrose and Tom await the vicar as he blesses the happy couple at the altar rail. Tom is eying up a really good photograph for Miss Esther and Mr. Stephen's wedding album. See the shot he was waiting for below. 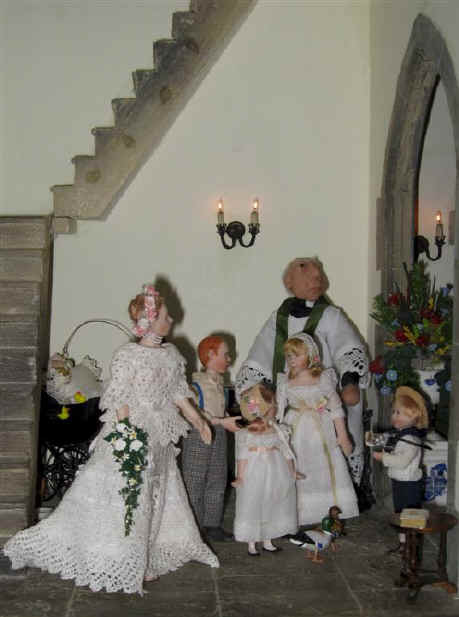 Tom ran right to the bottom of the church and stood next to the font to take this picture of the happy couple as the vicar was blessing them. What a wonderful photo it is too! After the wedding had finished the happy couple were only too pleased to pose as they cut the wedding cake at the back of the church. Hasn't Tom taken a really beautiful picture of Miss Esther and her groom, Mr. Stephen? Mr. Stephen and the vicar asked Ambrose to break open the bottle of champagne bought especially for this occasion by the vicar. Adele and Ben really WANTED some champagne too but they knew they would have to settle for some pop instead until they were a little bit older! The happy couple pose happily at the church door as man and wife! To see more of Tom's wedding photography visit Tom's Wedding Photos Gallery where you can see more close ups and details of Miss Esther and Mr. Stephen's wedding. Top To view the bride and groom with confetti you need the Java Plugin. 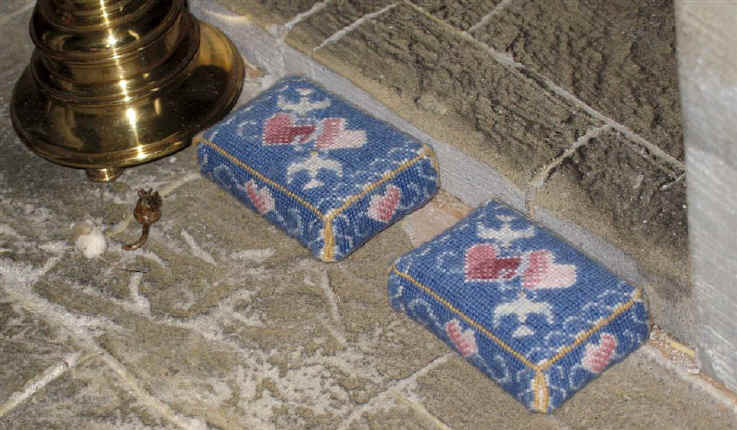 Many thanks to Nicola Mascall for designing our nuptial kneelers especially for St. Hilary's church and to Catherine Davies for stitching them.